Our itinerary said we would have a private city tour “after breakfast.” What did that mean, and how were we supposed to locate our guide, or vice versa? Breakfast at the hotel was from 7-10am, so Lynn and I had a leisurely couple cups of coffee and caught up on life events since we’d seen each other in Scotland. The standard breakfast in all four places we stayed in Colombia included: eggs however we wanted them, arepas or toast, juice, fruit, and coffee. Arepas are little round flat breads—slightly chewy inside and slightly crispy outside—made of ground maize (corn). They’re standard fare in Colombia and Venezuela. The fruit selection usually included fresh papaya, pineapple, melon and, at the first hotel, ground cherries. It got to be 9:30 and there was no sign of a guide so we moved toward the lobby to figure out Plan B. And there he was, waiting for us. “I expected you at 9:00,” he said. We explained the itinerary had been nonspecific. It wasn’t a big deal, and we were soon on our way. Michael was wearing bicycle gloves and carrying a bike helmet. 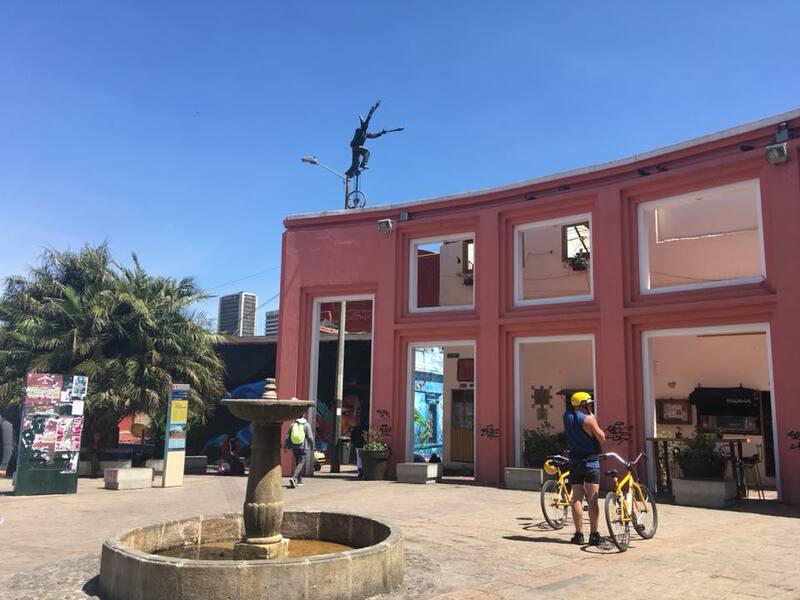 This was our introduction to how integral bike culture is in Colombia’s cities. Bogota, for instance, shuts down its main streets every Sunday for people to cycle from 7am to 2pm. Since the next day was Sunday, we witnessed this as we were being driven to the airport. There were thousands of people out bicycling—young and old, families and groups of teens. Some stopped to chat or picnic on the grassy medians, but mostly they were peddling. “Maybe that’s why you don’t see many fat people here,” I commented to our driver. I said “fat” rather than “overweight” because I wasn’t sure how much English he understood. He laughed and replied, in Spanish, that all the gorditos—fat people—lived on the coast, where it was too hot to exercise and they ate lots of fried food. “I’m a student, a biker, and an activist,” Michael told us by way of introduction. He appeared to be in his early 20s. His English was great and very, very fast. As he led us down the street it became clear he was an activist first and probably a biker second and student third. 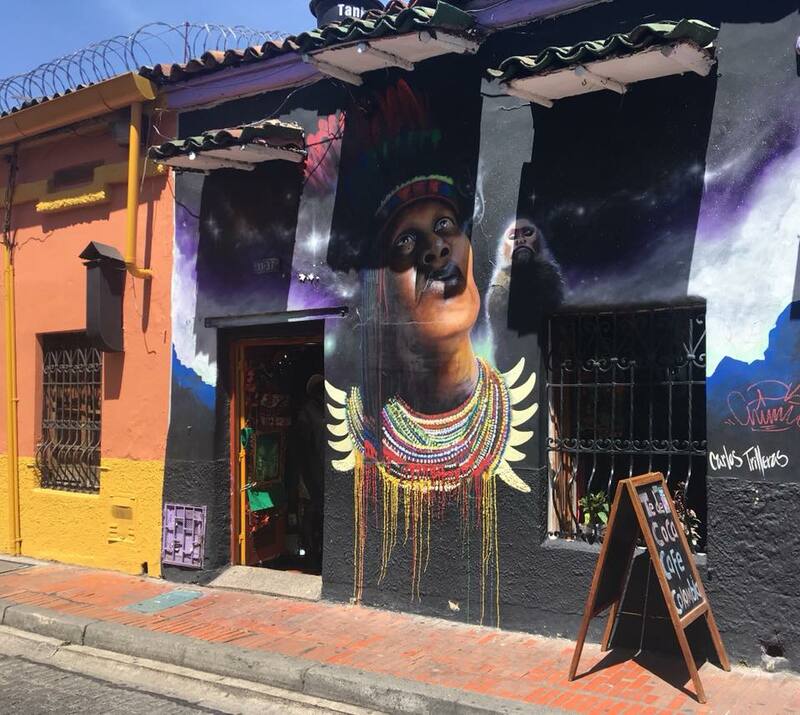 Bogota, Medellin, and Cartagena are home to impressive collections of public art. Some is government-sponsored, but much of it is in the form of murals depicting political-socioeconomic themes. 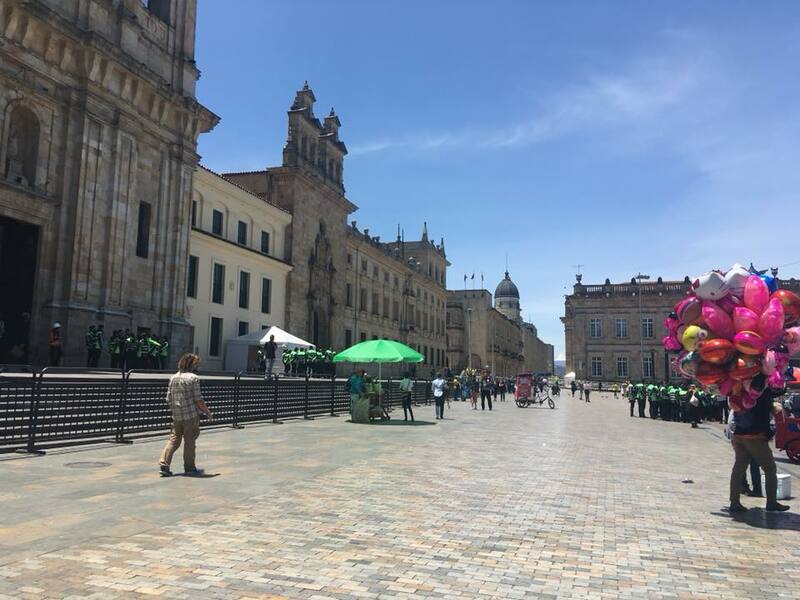 “We don’t consider ourselves Colombian, or Ecuadoran, or Bolivian, or Peruvian,” Michael explained. “We are indigenous, and we’re trying to make our voices heard but a handful of wealthy families own the country and control everything. 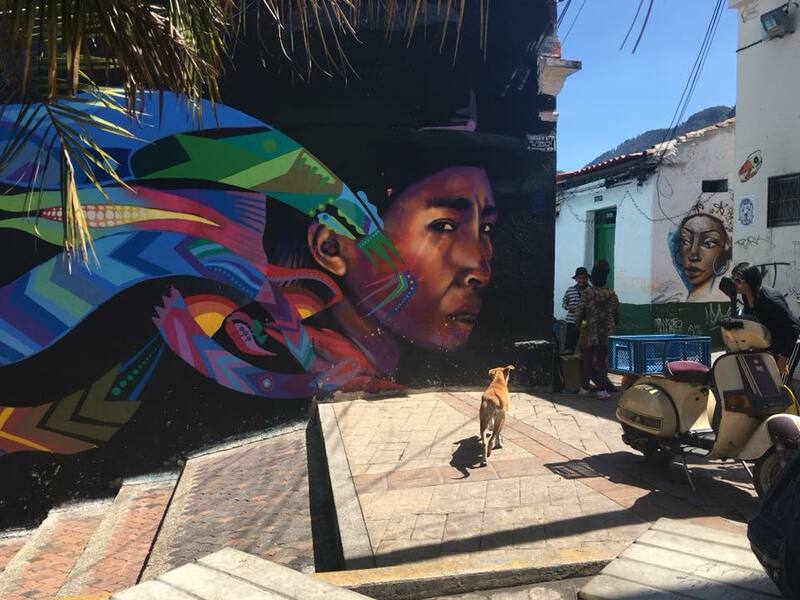 “For instance this is the Pachamama, the mother earth,” he said about this mural. “Maybe we could try it this afternoon,” I joked. He didn’t think that was funny, and Lynn had wisely not joked along with me. “It’s a medicine meant to be used only by shamans for spiritual purposes” Michael said, as he hurried us along. “He’s juggling, on a unicycle?” Lynn observed. “Much of the art is designed to be non-threatening, so it won’t be taken down,” Michael explained. We entered Bolivar Square. Simón José Antonio de la Santísima Trinidad de Bolívar y Palacios—or just Simón Bolívar, the liberator of the above-named countries plus Panama. If this had been Rome or Paris or London, this square would have had tens of thousands of tourists jostling each other for selfies and photo opps. But this is Colombia, in the early stages of tourism. We stood in the square for a long while as Michael related the recnet history of double crosses, coups, war, and massacres. No wonder people prefer to bike instead of attending church in the splendid but empty cathedral. 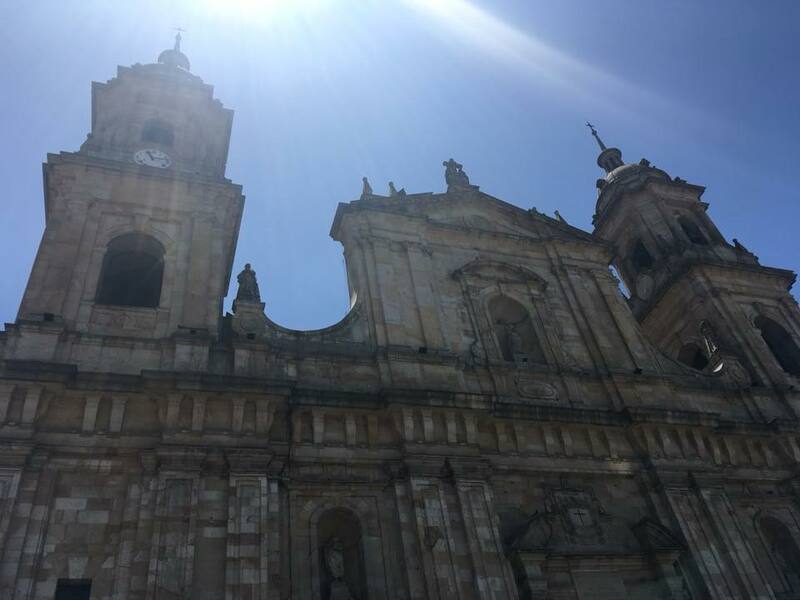 This entry was posted in Adventure, Atheism, Budget travel, Culture shock, International Development, Travel and tagged Bogota, Colombia, Indigenous People on April 3, 2018 by Breaking Free.